1. What is CAT Syllabus ? More than 2 lakh candidates appear for the Common Admission Test (CAT) every year for admissions to 20 Indian Institutes of Management (IIMs) and over 100 B-schools in India. The exam is held in November or December, once a year, by one of the IIMs. CAT 2018 was held on 25th November, 2018. Officially, the IIMs do not prescribe a CAT syllabus as such. Still, the exam follows a broad pattern, from which we can infer what the CAT syllabus is. CAT Exam is a 3-hour (180 min), computer-based exam. It is not held in offline mode. The exam is held in two slots—morning and afternoon—on the same day. The papers are different in these sessions, but the scores are normalized to account for the differences. The exam comprises of 3 sections— Verbal Ability and Reading Comprehension (VARC), Data Interpretation and Logical Reasoning (DI/LR) and Quantitative Ability (QA). In the last few CATs, the order of the sections has been VARC first, followed by DILR, followed by QA. Switching between sections is not possible. There are no breaks between sections. There are 100 questions in all. Most questions are Multiple Choice Questions (MCQs), with 4 answer choices, one of which is right. About one-third of the paper, however, consists of objective but non-MCQ questions. These are of the Type-In-The-Answer (TITA) kind. MCQs carry 3 marks for a right answer and -1 mark for a wrong answer, but there is no negative marking for TITA questions. A simple, on-screen calculator is provided for the QA and DI/LR sections. Any Bachelor’s degree holder (with 50% at least marks) and any candidate in the final year of their graduation can write CAT. CAT Syllabus details in video format. This CAT syllabus is drawn up based on the pattern of the exam over the last few years. In general, the CAT syllabus includes topics from Mathematics and English taught in schools up to 10th standard. However, the questions are application-oriented and test conceptual understanding. The VARC section of CAT is primarily a test of your reading ability, that is, your ability to understand and reflect on ideas given in a passage or paragraph. Others 3-4 questions, usually TITA, involving rearrangement of sentences in the right order. 2-3 questions, MCQs, involving identification of the best summary for a given paragraph. 2-3 questions, involving identification of the odd sentence in a given set of sentences. The DI LR section of CAT comprises of puzzles based on data sets. This section tests your ability to understand, identify patterns and derive conclusions based on the given data/clues. In total, there are 32 questions in this section, including 8-9 TITA questions. The QA section of CAT tests your understanding of some key mathematical concepts. The story of CAT Exam 2018 was the level of difficulty of the Quant section. I (Rajesh Balasubramanian) have taken 8 of the last 10 CATs and I can confidently say that this was the toughest Quant section I have seen thus far. We have done a CAT 2018 Analysis of Slot 1 and Slot 2 on Youtube. Scroll down to have a look at that. 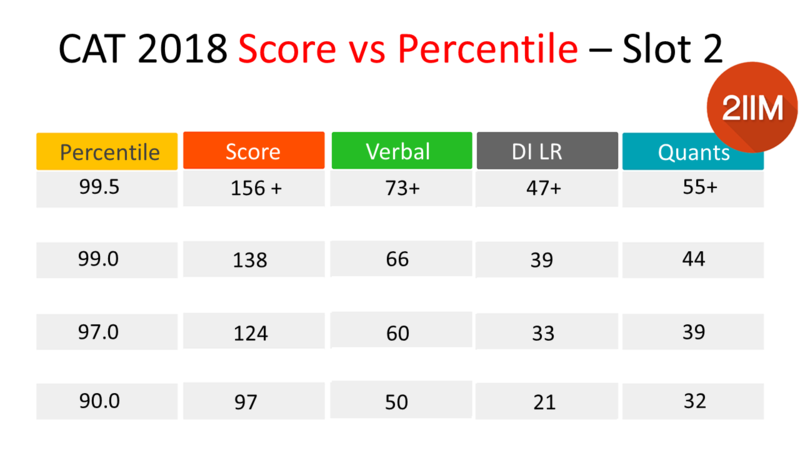 Our estimates for CAT Exam 2018 percentiles and scores are given below for both slot 1 and slot 2.Note that these are merely estimates and are not based on statistical analysis. It is not too early to start preparation. If you took CAT 2018 merely as a precursor to CAT 2019, then it is about time to start thinking about a pleasant 1-year preparation cycle. If you are not already one, sign up as a trial user to the 2IIM Online Course and see why so many students say so many good things about us (review link here). 2IIM’s CAT 2018 online students can renew the course at very reasonable rates. The price for renewal is pegged at a level where students pay the difference between our current 2019 price point and what they have paid already. Effectively, for students who are renewing the course, the price for preparation for CAT 2018 and CAT 2019 would be merely the price for CAT 2019 (In other words CAT 2018 prep came for free). I've Read Enough! Less talking, more teaching! Click the below button to signup to the most Comprehensive Online CAT Coaching for CAT 2019. Learn from the best for the CAT Exam. Sign-up takes less than 30 seconds. You can start your first free lesson in under 60 seconds. 9 full classes available completely free. The Proof of the pudding is in the eating. Try it out yourself before you decide on a Online CAT Coaching for CAT exam. Sign Up & Start Learning Now! CAT Youtube ChannelHundreds of videos on CAT Preparation and Coaching. CAT AnswersAnswers to all questions on How to prepare for CAT. CAT Question Paper Past CAT Question paper with video solutions and student friendly pdf's. Join our Facebook GroupAnd stay tuned for updates like question a day. CAT Preparation BlogExperts' take on all things CAT.